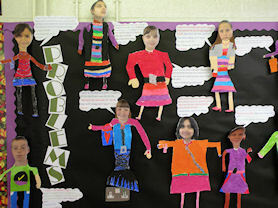 In our Maths and English work we follow the Primary Framework and we cover a range of topics including writing stories, creating newspaper articles, explanation texts and writing plays. 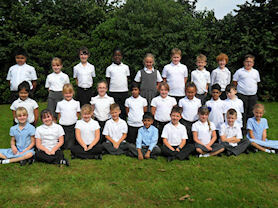 In Science in Year 4 we study habitats, how materials can change and the science of green plants. We have PE on a Monday and a Thursday and children learn new skills in gymnastics, hockey, athletics and swimming later on in the school year. 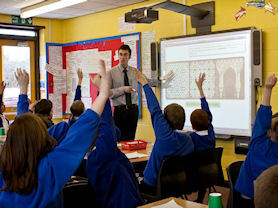 The children learn French in class and practise their language skills throughout school. Year 4 have timetabled use of the laptops where they will be learning new skills and putting them into practice to create a range of work. Learning about symmetry on the interactive whiteboard. 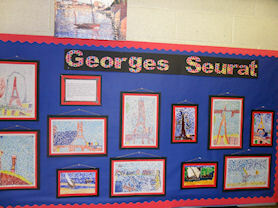 Artwork inspired by Georges Seurat. A combination of artwork and maths problems. 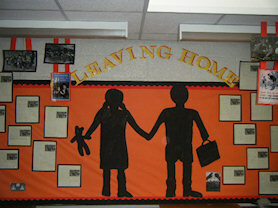 A classroom display on 'Leaving Home'.